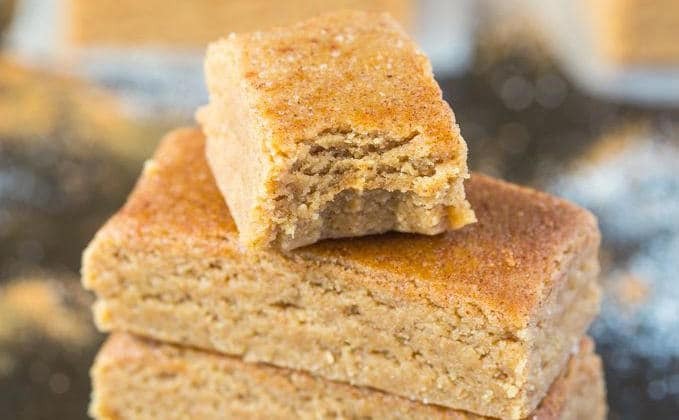 These protein bars are so easy to make that you don’t even need to be able to cook to enjoy healthy, tasty, homemade protein bars. If you are anything like me, sometimes you WANT to eat healthily but you just don’t have time to cook. These great protein bars are ideal for when you are short of time but don’t want to rely on store-bought produce. This is one of the more substantial protein bars – it’s quite high in carbs, fat and calories. Feel free to cut them up into smaller bars if you want a lighter snack. 1) Open a pack or a can of coconut cream. Whisk until the mixture is smooth. 2) Add vanilla whey protein powder and whisk until the mixture becomes smooth. 3) Add peanut butter and mix everything together with a spoon. You may need to warm your jar of peanut butter in a bowl of hot water to make it easier to work with. 4) Add uncooked oatmeal and mix well. You may need to use your hands at this point. 5) Flatten the mix in a dish.